What does the Fox say? I love you! Cut the white heart in half. Glue to the large orange heart. 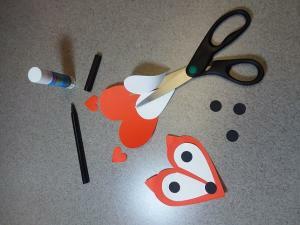 Turn 2 small hearts upside down and glue on the back for ears. Glue on black circles for eyes and nose or make eyes and nose with a black marker. Write a love note on the back.